We have answers! Give us a call and talk it through with us. Home Lighting in Do it yourself kits! Vinyl lamp post's give you maintenance free, yet beautiful lighting standards with our guarantee that they will not to yellow or fade. 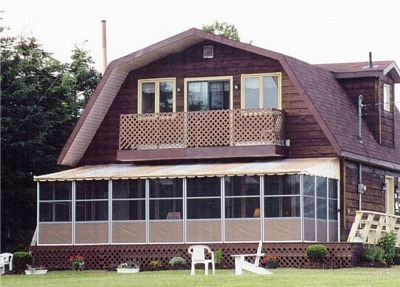 Constructed of high grade PVC vinyl that carries a 20 year warranty, the formula contains UV stabilizers protect the vinyl from harmful ultraviolet rays, so the posts will not fade over time. ▪ No Handling Costs, No additional charges! 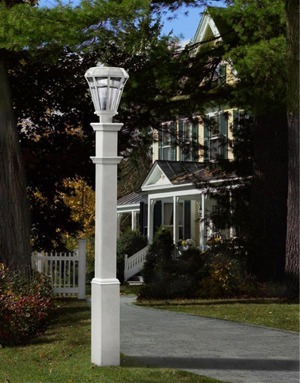 ▪ Post size 5" x 5"
The Sturbridge Lamp Post does more than just guide your footsteps. 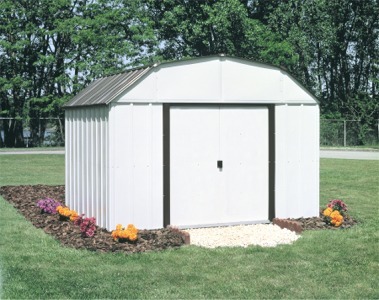 It’s a signature landmark that will compliment any setting surrounding it. The lamp post is crafted from premium weather-resistant vinyl that will withstand the elements. 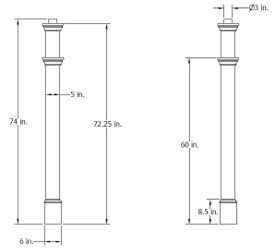 The Sturbridge lamp post comes with a universal 3 In. collar mounting cap, which means that any standard lamp will fit. We’re pleased to offer a 20 year warranty on this product, guaranteeing it not to fade, yellow, crack, or warp. 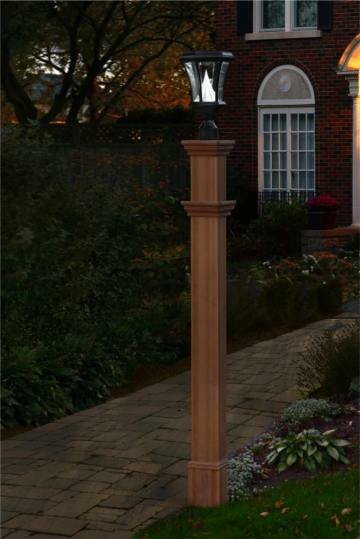 Modern and elegant, the Madison lamp post adds sophistication and illumination to any yard or walkway. 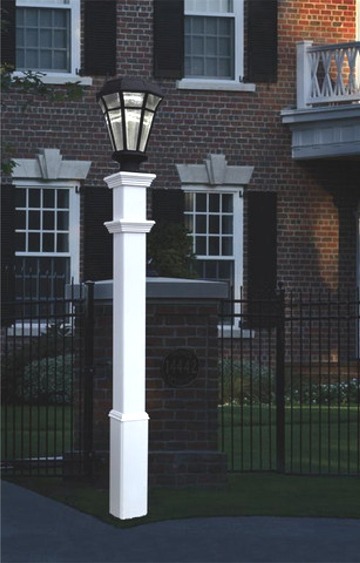 The Madison lamp post is crafted from premium weather-resistant vinyl that will withstand the elements. 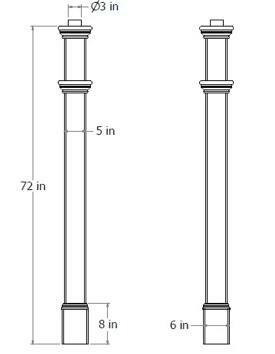 Your lamp post comes with a universal 3 In. collar mounting cap, which means that any standard lamp will fit on this cap. Stylish, sturdy and crafted to last, the Portsmouth Lamp post makes an elegant beacon, welcoming you home year after year. 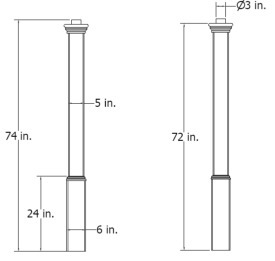 The Portsmouth lamp post comes with a universal 3 In. collar mounting cap, which means that any standard lamp will fit. We’re pleased to offer a 10 year warranty on this product, guaranteeing it not to fade, yellow, crack, or warp. Innovatively designed to look like natural wood while providing all of the maintenance-free, consumer friendly benefits of modern materials. 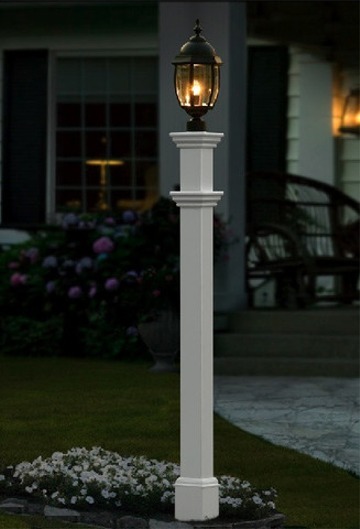 The stylish Charleston Lamp Post elegantly accentuates any yard. 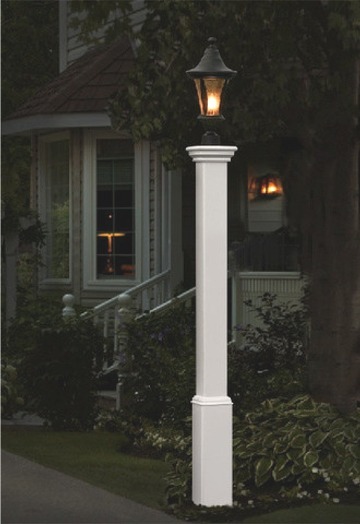 The Charleston Lamp Post adds a stylish accent to any yard, is easy to install, and features a universal 3” collar to accept either a solar or hardwired lamp. 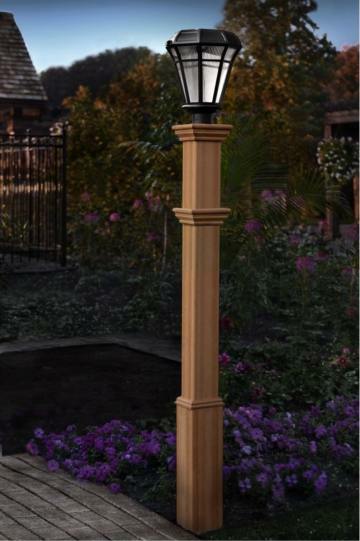 Naturally elegant, sturdy and crafted to last, the Trinity Lamp Post adds an attractive accent to any yard, with all of the beauty of natural wood, people won’t guess it’s actually crafted from a long lasting, maintenance free mixture of vinyl and recycled wood. 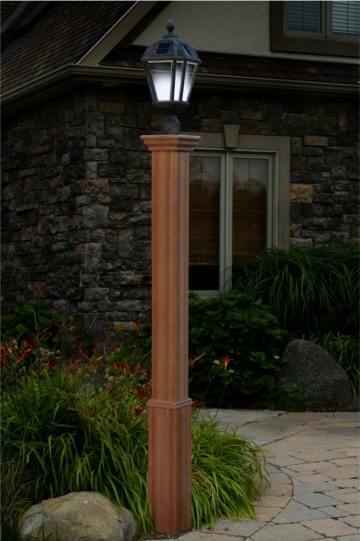 Easy to install, with a universal 3” collar allowing either a hardwired r solar lamp to be added the trinity lamp post is a fashionable choice in any setting.